While U.S. men and women put their lives at risk in Iraq, the MPAA has queried the military about the pirating habits of the soldiers stationed there. A declassified document from United States Central Command confirms that the MPAA is fighting a war of its own in the Middle East, one against copyright infringing soldiers. It is no secret that the MPAA is involved in an ongoing battle against copyright infringers in the United States. Tens of thousands of copyright notices are sent out each year informing illegal file-sharers that they are breaking the law. Less known are the movie industry’s efforts to clamp down on copyright infringers who are defending their country’s interests on foreign soil. Because the availability of legal movies and TV-shows is limited in countries such as Iraq, soldiers sometimes use BitTorrent to get their fix, or buy pirated DVDs from local sellers. The MPAA is not happy with these defiant soldiers. 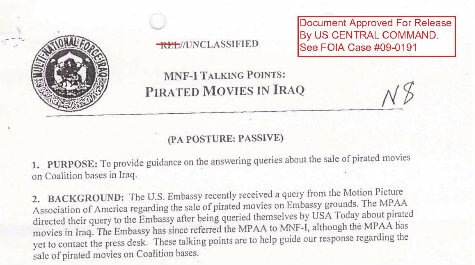 A declassified document from the United States Central Command shows that, a few years ago, the MPAA asked the military what they do to prevent soldiers from accessing pirated DVDs in Iraq. One of the questions posed by the MPAA is whether they have banned U.S. troops from going to stores that sell pirated DVDs. The Central Command answered this question negatively, as it would hurt the business of Iraqi salesmen. “No….banning our troops from visiting these shops would have the unwelcome secondary effect of harming Iraqi entrepreneurs selling legitimate goods.” They add that there is nothing they can do about DVDs that are being sold on Iraqi property because these stores fall under Iraqi law. The document does state, however, that selling pirated DVDs on US bases is not permitted. It further says that piracy could be reduced by giving soldiers access to legal forms of entertainment. “U.S. forces have had a long-standing, positive relationship with the entertainment industry. Working to continue this relationship, including the provision of popular entertainment like first-run movies, concerts and other events will help to curtail the demand for pirated media,” it states. Pirated DVDs are not the only worry for the MPAA as more recently military personnel have also been using BitTorrent to access U.S. entertainment on foreign bases. A military insider told TorrentFreak that they see no other option than to ‘pirate’, as the entertainment industry gives them little opportunity to enjoy digital media legally. “We have sent letters to the RIAA and the MPAA repeatedly letting them know that our downloads are a direct representation of their failure to allow us to be good consumers as others in the US can be,” our military insider explained. Instead of holding out a helping hand to deployed soldiers, the entertainment industries continue to treat them as criminals. On a daily basis, the MPAA and RIAA send copyright notices to military personnel via their base ISPs. In turn, the personnel are threatened with account suspension and in serious cases, disconnection. At the same time Hollywood continues to exploit military conflicts with hit shows like The Pacific and Oscar-winning movies such as The Hurt Locker. Ironically, The Hurt Locker centers around a friendship between a heroic soldier and a young Iraqi boy who sells pirated DVDs at a U.S. base. c There are 197 comments. Add yours?